What are you planning to do with your bouquet (or a smaller version)? 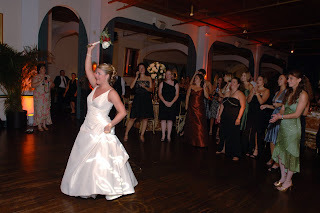 Will you stick with tradition and toss your bouquet to a group of your single ladies? Will you have an anniversary dance and see who the last couple dancing(longest married) is? Will you present your bouquet to someone special? What else are you thinking? Please post your ideas or what you are seeing this year? tradition is very very important, so have to toss. Can't afford a full service planner?